Oscar Night 2009 is upon us with first-time host Hugh Jackman. Join us as we give almost-live coverage! To start the awards, Jackman provided viewers with a solid opening that was effective and not too over-the-top. Then we moved right into the ceremony with five previous Best Supporting Actress winners coming on stage to say something nice about of this year’s five nominees. Tilda Swinton who was last year’s winner was the quarterback for this segment and she had the honor of announcing the winner. This was unexpected but not undeserved - It was a rather difficult category to pick this year with all five nominees being almost equally likely winners. Personally, I would have gone with Taraji P. Henson from The Curious Case of Benjamin Button. Next we have Steve Martin and Tina Fey giving a good little skit to present the nominations for best Original Screenplay. It was a touching acceptance speech and well-spoken (arguably the best acceptance of the night). Not wasting any time, Fey and Martin continue on to announce the nominations for Best Adapted Screenplay. Next, Jennifer Anniston and Jack Black came out and tried to be funny and it didn’t work too well. However, Jack Black did made a joke about animated films and how he earns his money and it was pretty good. After playing a video of all the major animated features of the night, they eventually got to announcing the nominees for best animated feature and best animated short of the year. Andrew Stanton accepted the award and again we were a treated to a quick and efficient acceptance speech. So far, the awards have flown by and I think the Academy’s years of rushing people off stage have paid off (as cruel as that is). They’ve also had some of the presenters do multiple awards to keep things quick as opposed to constantly switching celebrities to announce each of the 24 categories. So far, they’ve tried to keep a light atmosphere with comedic presenters. After the Commercial Break, Hugh announced the next presenters Sarah Jessica Parker and Daniel Craig (in James Bond attire) who gave a boring presentation just reading off the prompter. They announced the nominees and winners for Best Art Direction, Best Costume Design and Best Makeup. This was the first category we see The Dark Knight involved in and the winner was a no-brainer as this movie clearly had the most extensive set design and behind-the-scenes work involved. The acceptors of the award gave much respect and recognition to director David Fincher. It was almost painful to watch Craig and Parker making multiple mistakes reading off the prompter and missing their cues. As for the winner, it’s not my pick personally but this award does tend to go to the period pieces. Next we have the Academy desperately trying to appease presenters the younger demographics with Robert Pattinson and Amanda Seyfried on stage to present a vignette of romance films of 2008 which hit many of the mainstream flicks of the year. After the commercial break, Jackman introduced the presenters for Best Cinematography and to my delight Natalie Portman and Ben Stiller (sporting a funky beard to parody Joaquin Phoenix’s presence on the recent David Letterman show) came on stage. Stiller even re-enacted the gum incident by putting his chewing gum on the stand after Portman confronted him about it. This was definitely one of the funniest moments of the night and as the beautiful Natalie Portman announced the nominees, Stiller walked around the stage with his cellphone out acting as if he was lost. Next we have another highlight of the night with James Franco and a skinnier Seth Rogen re-enacting a scene from Pineapple Express where they’re now watching all the non-Oscar nominated films and loving it while high on their drug of choice. It was pretty funny watching them laughing their way through serious moments and terrible films like The Love Guru and it got even funnier when Franco noticed the film crew in his room and invited cinematographer to sit with them and watch. After the video, the three of them came out to announce the nominees for best Live Action Short. After the commercial break we have host Hugh Jackman back to discuss musicals and give a little one himself where he was joined by Beyonce Knowles in a classy red dress doing some great dancing accompanied by mediocre lip-syncing. The performance was later joined by Zac Efron and Vanessa Hudgens of High School Musical Fame as well as Amanda Seyfried from Mamma Mia. Another commercial break and we are given a similar to the setup for The Best Supporting Actress award, where five previous winners of the Best Supporting Actor award came out to praise this years nominees of the same category. Alan Arkin, Christopher Walken, Cuba Gooding Jr. Kevin Kline and Joel Grey were the presenters and Cuba Gooding stood out by harping on (and at the same time praising) Robert Downey Jr.’s performance from Tropic Thunder. 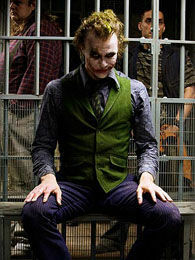 11) Winner for Best Supporting Actor: Heath Ledger, The Dark Knight (obvious). Next we have a nice video showcasing the directors of 2008’s best Documentaries. This was an awesome acceptance by the star of the documentary who gave us a nice little magic trick with his lucky coin followed by a balancing act involving the Oscar award and his chin. Next, Jackman presented a video of many of the big action scenes of 2008 followed by welcoming Will Smith to the stage to present the nominees for Best Visual Effects, Best Sound Editing, Best Sound Mixing and Best Editing. The Dark Knight earns its first award of the night and Benjamin Button wins another. They’re really trying to get these awards for behind-the-scenes work out of the way quick. Next we have Eddie Murphy come out on stage to announce the Jean Hersholt Humanitarian Award to Jerry Lewis who received an honorable standing ovation from the star-studded audience. Continuing the need to meet the youth quota, Zac Efron and Alicia Keys came on stage to present the nominees for Best Original Score and Best Original Song. 19) Winner Best Original Song: “Jai Ho”, Slumdog Millionaire (another given for me, this song was awesome in the film and when presented live on stage before the winner was announced). Next on stage are Liam Neeson joined by Freida Pinto from Slumdog Millionaire to present best Foreign Film. After a song by Queen Latifah Hugh Jackman honors the present of the Academy Awards who's stepping down this year. After this, Reese Witherspoon is introduced by Hugh Jackman to announce the nominees for Best Director. Mr. Boyle gave a nice little dance to keep a promise made to his kids. It was cute and he deserved this award. As we're in the final stretch of the show, the next major award is for Best Actress and again they brought out five previous winners including Halle Berry and Nicole Kidman to honor this year's nominees. I like this strategy and it's better than just having a winner from the Best Actor/Actress category of the previous year. Finally, Kate has won! Meryl Streep was amazing in Doubt but she's had 15 nominations and several wins before. It's time for Ms. Winslet to share in the glory and you can tell from her speech that she really wanted it. For the Best Actor award, presenters Michael Douglas, Robert De Niro, Sir Ben Kingsley, Anthony Hopkins and Adrian Brody (all past winners) have come on stage to praise this year's nominees. Robert De Niro was especially funny in talking about Sean Penn and Anthony Hopkins and Ben Kingsley had very nice things to say about Brad Pitt and Mickey Rourke, respectively. Sean Penn wins another for his outstanding performance in Milk and he gave a funny opening line in his acceptance speech. He ended his speech touching on a serious note and preaching for equal rights for which he received a loud applause. He also gave credit to Mickey Rourke whom I thought may win this award. Stephen Spielberg is next on stage to present the nominees and award for the final and most important category of the night: Best Picture. I'm happy that Slumdog Millionaire beat out The Curious Case of Benjamin Button. I thought Button was great but it was missing some elements that Forrest Gump had and that's what it is always compared to. I thought Slumdog was the best overall film of the year and it did deserve this award. So there you have it folks, the summary of this evening's 81st Academy Awards and all of the winners. All-in-all, the night was a slight improvement over previous years. I think the big problem this year was with the nominations and certain omissions in certain categories. What did you think of this year's Oscar awards and what would you like to see improved for next year's?